A prominent blogger said Monday that he and his family in central Vietnam have been victimized by what he believes are agents hired by local security forces to threaten him over his online criticism against the state. 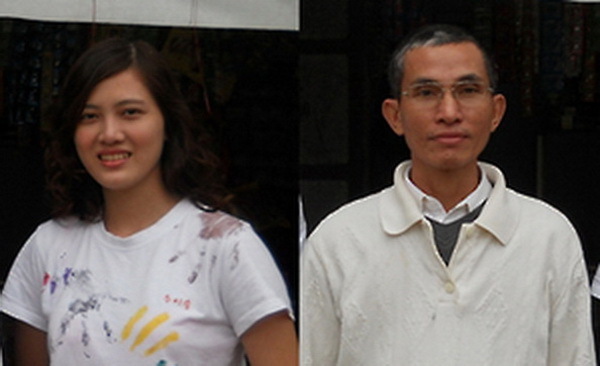 Blogger Huynh Thuc Vy (left), and her father, democracy activist Huynh Ngoc Tuan (right). 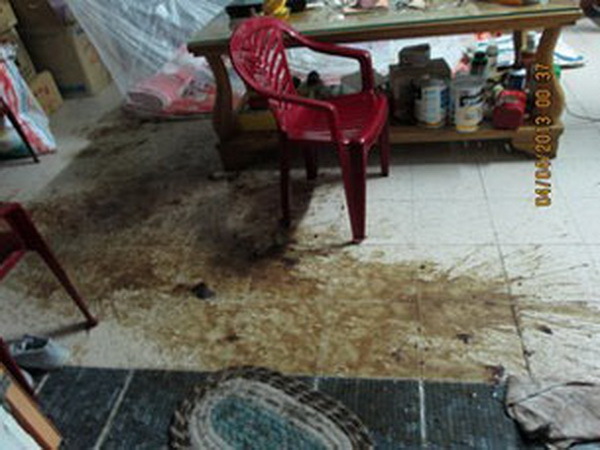 The once-imprisoned Huynh Ngoc Tuan, 50, told RFA’s Vietnamese Service that the attack occurred at 12:30 a.m. on April 4 when two assailants pulled up to his home in Quang Nam province on a motorbike and threw rank liquid near his bedroom. “I heard the sound of a motorbike outside, which was nothing strange, but then I heard the sound of water splashing onto our steel gate … twice. Then I came out of my house because I knew something was going on,” Tuan said. “In the light from the neighbor’s house I saw the backs of two young men. I saw that the water was thick and contained fish heads and organs, as well as some human excrement. It was overpowering,” he said. Tuan said that he woke everyone in the house up and told his eldest daughter, Huynh Thuc Vy, to take pictures of the liquid. “Thuc Vy ran out, and when she smelled it she threw up,” he said. The family spent the entire night cleaning the house, Tuan said, but was unable to get rid of the stench. “The neighbors smelled the liquid and asked what had happened and who had done it. I told them that it was probably the police that had attacked our family … because they don’t like me, but have no legal basis to make me stop writing,” he said. Police have harassed the Huynh family at their home in Quang Nam in recent years since Tuan, a member of the government-banned Unified Buddhist Church of Vietnam (UBCV), and his eldest daughter Huynh Thuc Vy began receiving attention for their blogs. According to Paris-based Vietnam Committee on Human Rights (VCHR), security agents recently threw two venomous snakes into Thuc Vy’s home as a warning to stop her blogging activities as a political and social commentator. More recently, the group said, local police pressured the landlord of Tuan’s younger daughter Huynh Khanh Vy to expel her from her lodgings in Danang just two weeks after she had given birth. Her request for a scholarship to study in Australia was also blocked. Less than three weeks ago, Khanh Vy told RFA’s Vietnamese Service that she and her husband had been targeted for frequent residence permit checks and had lost job opportunities because of police intervention. In 2011, police raided the Huynh family home in Tam Ky, confiscating their computers. The next year, after Thuc Vy went to Ho Chi Minh City to take part in an anti-China demonstration, police took her into custody and drove her back to Quang Nam, in what she said was an attempt to scare her into avoiding future protests. After Thuc Vy and her father Tuan were each awarded an international free speech prize last year, Huynh Trong Hieu, the brother, planned to travel to pick the awards up on their behalf, but was barred from leaving Vietnam and had his passport confiscated. Khanh Vy, Thuc Vy, and Trong Hieu, who is also a blogger, are all in their twenties. Tuan was arrested in 1992 and sentenced to 10 years in prison for “spreading propaganda” against the one-party communist state. He was released in 2002, but remained under house arrest for the next four years. Vietnamese authorities have jailed and harassed dozens of bloggers, citizen journalists, and activists over their online writings since stepping up a crackdown on freedom of expression in recent years. Many have been jailed under Article 88 of the Vietnamese Criminal Code for “conducting propaganda against the state,” and international rights groups and press freedom watchdogs have accused Hanoi of using the vaguely worded provision to silence dissent.